School Board member Carol Carstensen, who chairs the long range planning committee, said she has been very troubled by the tone of many of the e-mails she and other board members have been getting regarding the proposed changes. “It’s dramatized for me the significant gap we have in our community,” she said. “It’s very troubling that we are increasingly separating ourselves and that there are parents who are saying they will not allow their children the experience of going to school with ‘those children,'” she said. “The performance and the test scores simply don’t warrant this kind of reaction,” she said, adding that hearsay, not actual experience, is fueling a gap between perception and reality at many low income schools. “My children attended East, and I know how painful it is to have the school your kids attend labeled as some kind of loser ghetto school,” she [Mathiak]said. “My kids came out of their school experiences as well-educated for life success as I could possibly hope,” she added. Beth Moss, who is the third member of the long-range planning committee, and who has children who attend Jefferson, said a school’s reputation can change quickly. “Last year I was sitting with a group of very irate parents who were extremely concerned about school safety, violence and bullying at Jefferson,” she said. “We talked about it, and some changes were made, but I do find it kind of ironic that now Jefferson is seen as some kind of nirvana,” she said. I’m glad to hear this from our Board members. The many comments on the Capital Times story show others talking directly about the difficult issues of race, class and diversity. Not everything said there is constructive, but I do think that airing this is better than pretending it doesn’t exist. Another good sign is the use of language and concepts from the Equity Task Force work at the Long Range Planning forum last week. The notes are posted here. 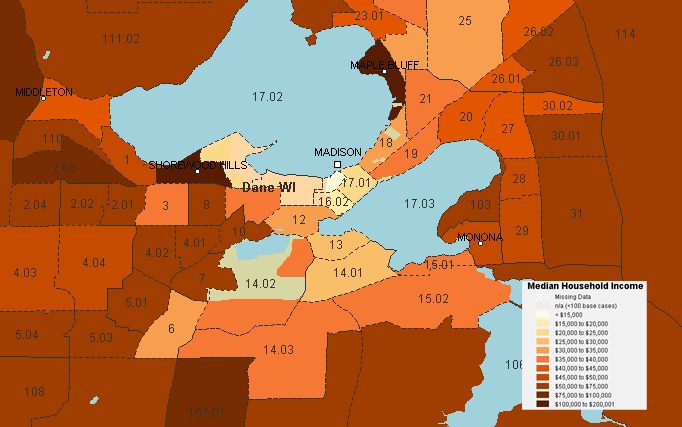 Even though the Board has not directly addressed that portion of the Task Force recommendations, the idea that Madison needs to take affirmative steps to create and maintain schools with reasonably balanced socio economic characteristics (and that schools with low poverty numbers are as unacceptable as schools with high poverty numbers) seems to be gaining currency with some. More good news. And on a non-local note, Mica Pollock, the author of Colormute: Race Talk Dilemmas in an American School and editor of Everyday Antiracism: Getting Real About Race in School (discussed in the previous post), will be participating in an on-line chat hosted by EducationWeek.org. the chat will be on February 27, but they are taking questions now. More info here.